When it comes to choosing the right aeration system for your small pond or water garden, here's a few things to keep in mind. You want an aerator that will run efficiently and reliably. You want to be able to sleep soundly at night knowing your fish are well cared for and supported, and the pond is getting the oxygen and circulation that it really needs to be healthy. If it's cold and icy outside you want to know that the aerator you have in your pond is keeping the ice open during those winter days and nights. And ultimately you don't want to spend an arm and a leg just to run the thing. So over the years, we've gone through a number of small pond aerators. Some have worked exceptionally well and others failed in one way or another. What you're looking at below is the cream of the crop. These are the time tested, proven in the field (or pond) kits that are some of the very best in the industry. From the Pond Air 2 which covers ponds of just a few hundred gallons up to about 2,000 gallons, up to the Koi Air 2 for ponds up to 16,000 gallons, this is a solid line up of small pond packages. Choosing the right aerator for you small pond is really easy. You'll find specifications listed with each aerator on their product page. Note the gallons size listed there AND the depth rating of each unit. Pick an aerator that's capable of covering a pond up to your pond's gallon size. To some extent these are just rough estimates and you could go a bit above the gallon size listed in some cases. Most importantly, know the depth of your pond. Then select an aerator that will go that deep or deeper. One example is the Koi Air systems are very well suited to ponds up to 4 feet deep, but they can't go much beyond that. The Pro 60 aerator however can go up to 10' deep so this is well suited to ponds beyond 4' in depth and from around 6,000 to 12,000 gallons. Rest assured that no matter your pond's size or depth, we can design and aerator system that will work well in it. If you don't see something that will fit your needs already, be sure to contact us. 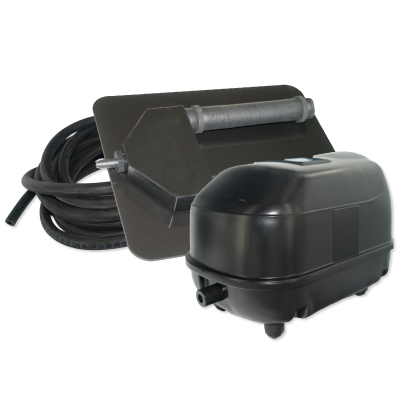 All of our small pond kits use linear compressors to create the air flow. These are reliable and efficient and they don't require much in terms of routine maintenance. Periodically you will want to clean any air filters on the compressor, and at some point during the operation life, the diaphragms, which produce the air, will wear out and need to be replaced. Diaphragm replacement is indicated when you see a drop in the air output of the diffusers. Should you see this, simply turn the compressor off, and pick up a diaphragm replacement kit in our accessories department. These are quickly and easily changed out in a few minutes, with a few simple tools, and you can be back up and running again in no time. *Repair and replacement parts are available on all of our systems. Please contact us should you need anything!